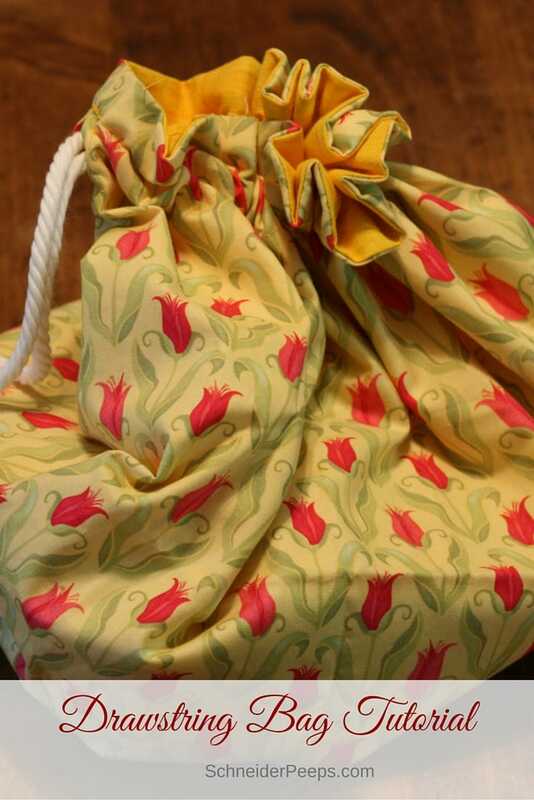 One can never have too many bags and this drawstring bag can be used for so many things. We’re using it keep crochet work tidy. What would you use if for? 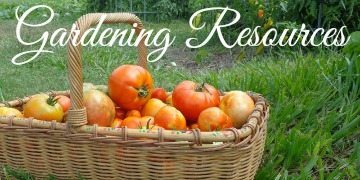 A couple of our homeschool co-op moms agreed to teach crocheting as a class this year. Oh, I wish I could sit in on that class! But since I can’t I was super happy when they said they would teach two classes, one for elementary and one for jr/sr high. So, Esther is taking crocheting. 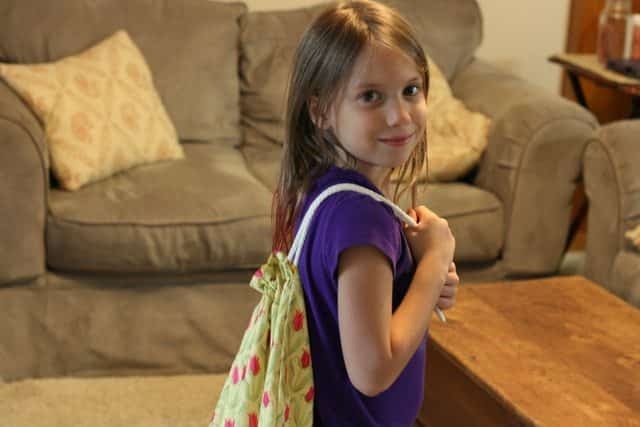 Which means she needs a bag to carry all her crocheting stuff in right? I decided on a drawstring bag so that she can close it while crocheting to keep the yarn balls from rolling out. I decided to put a little pocket inside to hold her crochet hooks. And because I’m super nice, I took photos while I made this drawstring bag…you know, the day before co-op began…so I could do a short tutorial for you. I don’t know if I have a photo for every single step so if you don’t understand something, feel free to ask me about it. You can make these bags any size you want but I’m going to share the measurements I used. Also, if you make a rectangle instead of square just make sure that the long side is the high side, not the wide side. Cut your pieces of fabric. I used 18″ X 18″ pieces for Esther’s bag. You need two for the outside and two for the lining. To make the pocket you need a 4″ X 5″ piece. 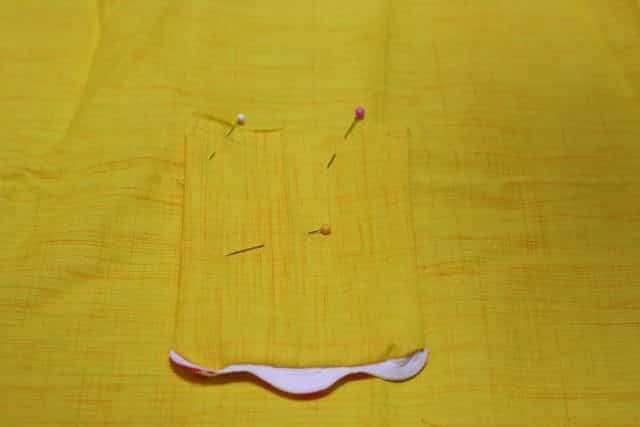 To make the pocket, pin the fabric with right sides together. I put a little ric rac in between the pieces at the top for a little bit of decoration but you don’t have to if you don’t want to. 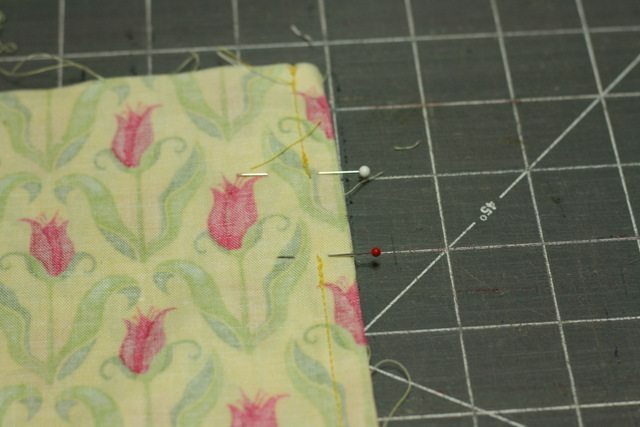 Using a 1/4″ seam sew the sides and top of the pieces together. Turn it right side out. The bottom is open so this should be easy. Now pin it upside down onto one of the lining pieces. Put the open side where you want the bottom of the pocket to be. 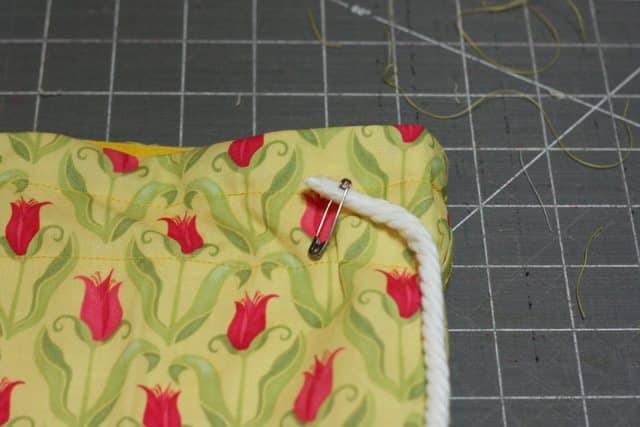 I always pin it and then lift it up and make sure the top of the pocket isn’t hanging over the top of the lining. 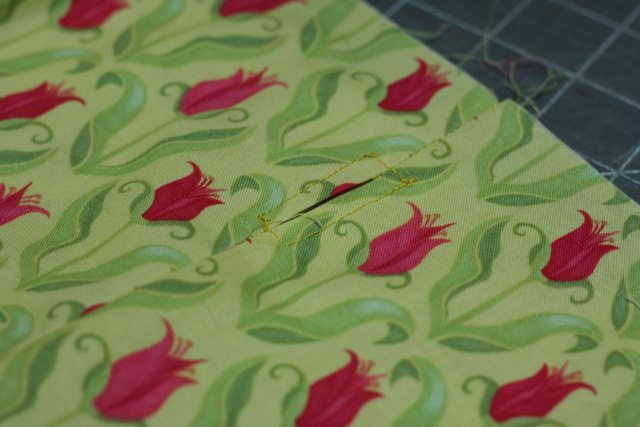 Using a 1/4″ seam stitch the open end to the lining. 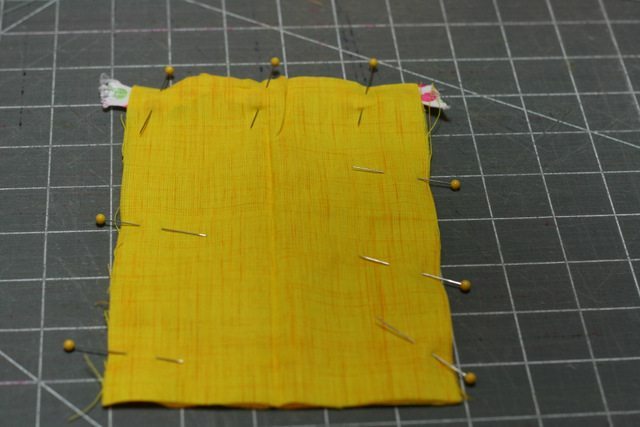 After the bottom is stitched, take out the pins and flip the pocket up. Pin the sides to the lining fabric. Stitch the sides and bottom to the lining fabric. Now you have a super tidy pocket. 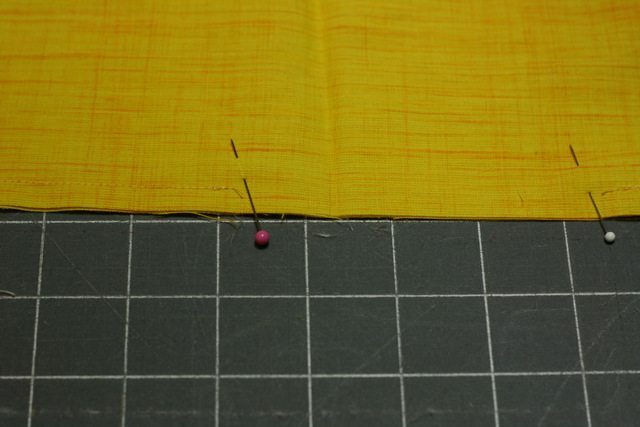 Pin your two lined pieces with right sides together. 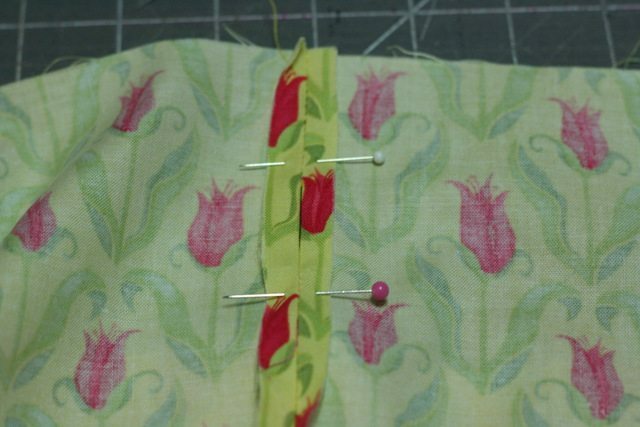 You will need to leave a hole in the bottom of the lining, so I like to use different colored pins to remind me to stop sewing and resume a few inches later. 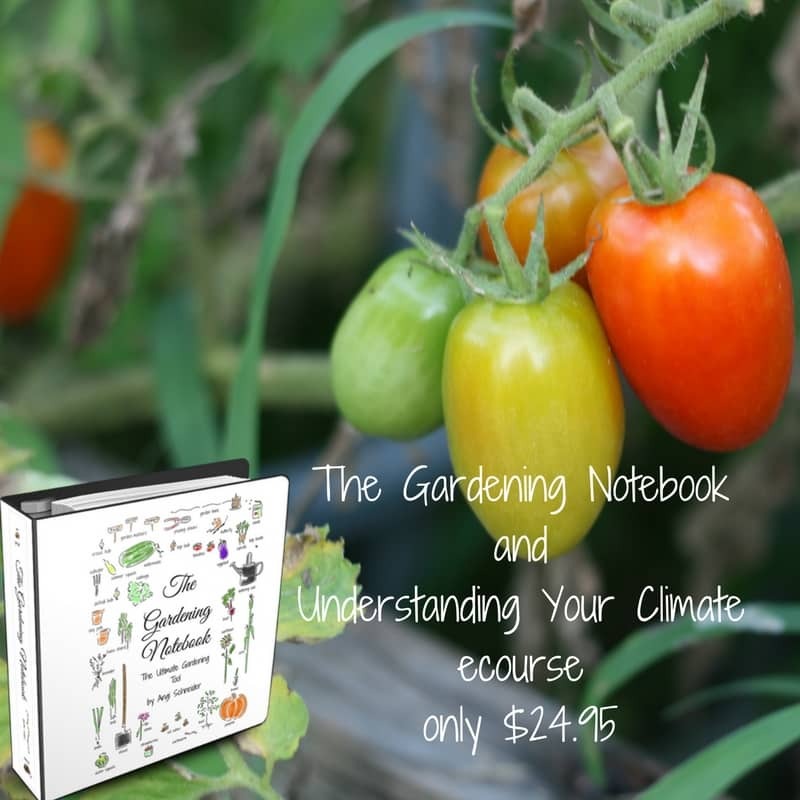 You could also mark it with a fabric marker or do whatever you need to do to make sure you leave a hole. Stitch the two sides and the bottom – leaving the hole. So your lining will have a hole in the top and smaller hole in the bottom. 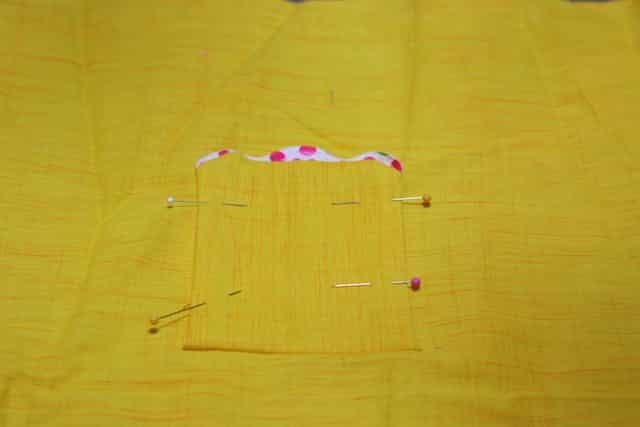 Pin the outer fabric with right sides together. On one side, near the top, you will need to leave a 1″ hole. So, measure down 1 1/4″ from the top and mark it in some way, then measure 2 1/4″ from the top and mark that. Stitch the sides and bottom of the outer fabric together. Be sure not to sew in between your markings on the side. After you’ve stitched the outer fabric together, this is what the inside seam should look like. Pin the seam allowance down and stitch around the opening. This is what it will look like from the outside. Now that the outer fabric and the lining are complete, it’s time to sew them together. 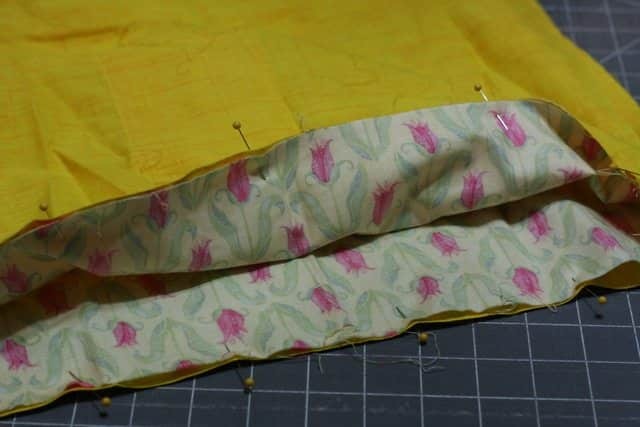 Turn the outer fabric right side out and put it into the lining so that right sides are together. 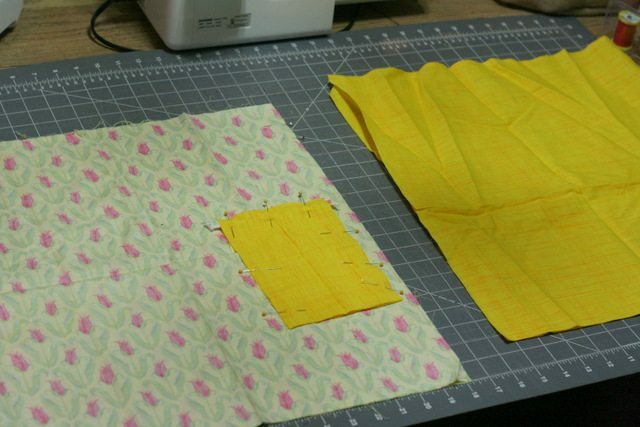 Pin the tops together and stitch using a 1/4″ seam allowance. Once the top is sewn, pull the outer fabric though the hole in the bottom of the lining (you remembered to leave a hole, right?) Then, you need to stitch the hole closed. I don’t have a photo of this, but I just tuck the raw edges in and machine sew it closed. 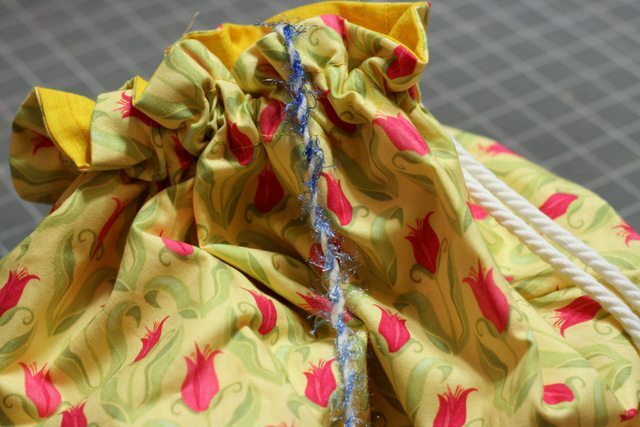 After the hole is closed, push the lining inside the outer fabric and it should look like a bag or sack. 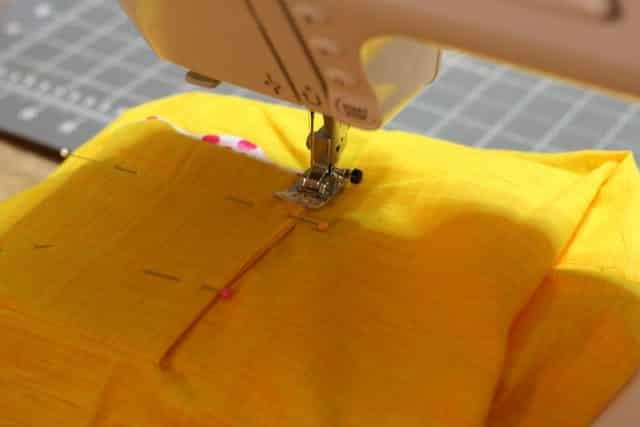 The last thing you need to sew is a casing for the rope. This is easy. Remember the opening that we sewed a rectangle around on the side? 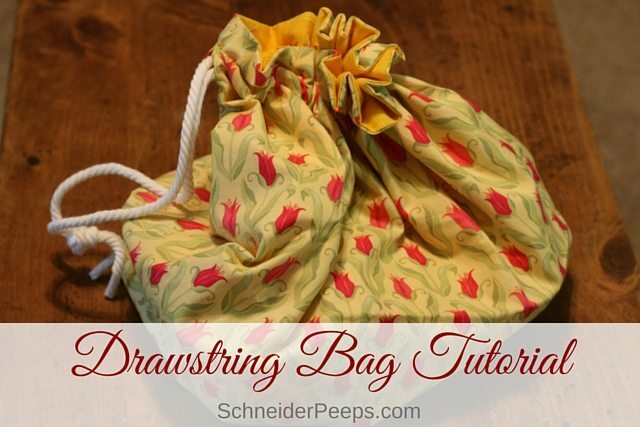 Use that as your guide and just stitch all around the bag twice, once on top and once on bottom of the opening. Using a safety pin attached to one end of the rope, feed it through the hole, all around the bag, and back out the hole. Tie the rope in an overhand knot. 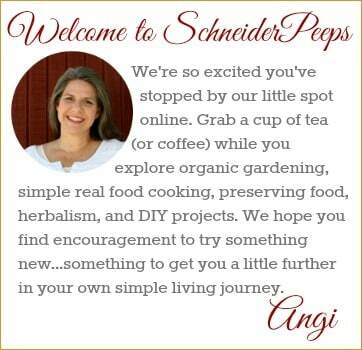 Here is what it looks like filled with crocheting goodies. 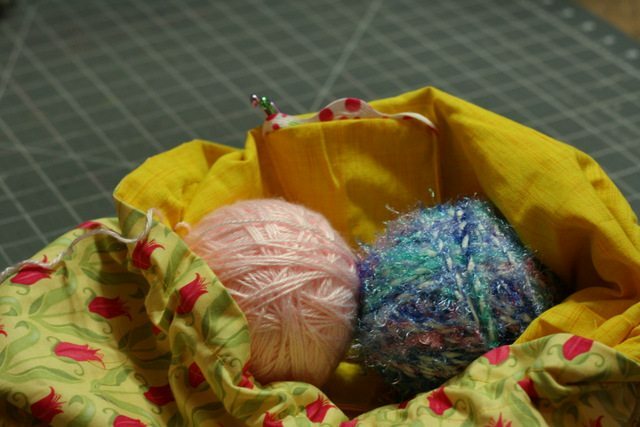 See how you can pull some yarn out but close the bag up so the balls don’t roll around? When she needs to put her project away, she just opens the bag and plops it. And here we are, the day before co-op, ready to go.